his floor scale is constructed of heavy gauge tubular stainless steel and features a 24" x 24" platter for plenty of weighing surface. 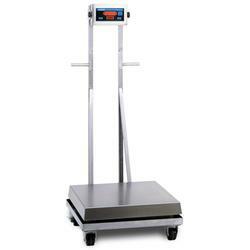 Customize this portable floor scale with your choice of seven different digital weight indicators. From the basic 7000XL digital weight indicator to the intrinsically safe 9000XL/IS indicator, chances are good we have a digital weight indicator to match your specific weighing application. Allso Available with 2200, 2200CW, 7400M, 8000IS Indcators. Washdown Safe Workhorse This floor scale is constructed of heavy gauge tubular stainless steel and features a 24" x 24" platter for plenty of weighing surface. Customize this portable floor scale with your choice of seven different digital weight indicators. From the basic 7000XL digital weight indicator to the intrinsically safe 9000XL/IS indicator, chances are good we have a digital weight indicator to match your specific weighing application. Outstanding Durability & Reliability A side load and vertical load protection systems using rubber shock mounts prevents load cell sensor damage from impact and overloading. The sturdy, welded tube mild steel frame of the base is designed to withstand the use and abuse of extreme industrial applications. Damage to the electronics from Electrostatic Discharge is prevented with an advanced electronic design. Engineered to stand up in the harshest environment, the sealed, super tough ?Guardian©? touch panel resists moisture and puncture damage. Simple controls - ZERO, UNITS, and PRINT - make it easy to use, quick to train employees and prevents operator error. Take the 7000XL or 8000XL Indicator to new levels with the enhanced features made possible with the new Excel Series Design. Choose from a variety of communication options including Wired or Wireless Ethernet. Control a mixing or batching operation by simply adding setpoints and relays. The basic controls are all here - Zero, Units, and Print, you can't get any simpler than that. The benefit to you is a scale that is easy to operate and train employees to use - reducing operator error. Dimension setup and communications Windows software.